Choosing the cigar for tonight’s tasting was a no-brainer. I reached into the humidor to see what I could find and spied a CAO Sopranos Edition. Given the recent death of Tony Soprano (James Gandolfini), I had no choice but to select this stick as my small tribute. As to the beer, well, let’s talk about the beer. The things I do for you. I really took a bullet on this one. I was intrigued before Budweiser released Black Crown, by what had to be the stupidest ad campaign ever created. Before any details of the beer were released, Budweiser had billboards proclaiming: “taste arrives on October 15.” I’m making up the date, because I don’t remember what it was, but the obvious message was that previously, Budweiser had never offered taste. Having figured out that the new beer is Black Crown, I picked up a single bottle at my local store this week and committed to reviewing it, even though Budweiser almost always gives me a screaming headache. I went into this with a completely open mind. Indeed, with the major breweries wanting to be perceived as craft breweries, I anticipated that this might actually be a decent beer since Budweiser was claiming it is its “crown” achievement. 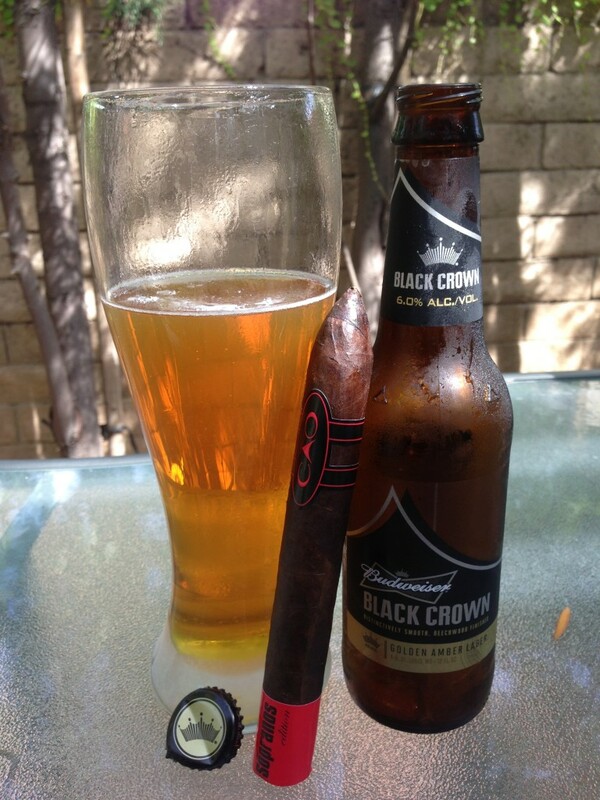 Just as the outfit makes the man, the ingredients of Black Crown are at its heart. Black Crown is a golden amber lager brewed with toasted caramel malt, a variety of American hops, and finished over beechwood to ensure that it is as distinctive as the people who drink it. These “distinctive” Budweiser drinkers are easy to spot. They’ll be the ones with screaming headaches. I don’t want to speak ill of the dead, or in this case ill of the cigar I am smoking in his honor, but the CAO Sopranos Edition did not impress. This stick made Cigar Aficionado’s Top 25 Cigars in the world for 2005, but either they were crazy or this cigar has seriously slipped in the intervening 8 years. This is one of the most exciting releases of the past several years. The cigar is a legitimately fantastic premium blend. I must admit when word of this project was first heard, I assumed it would be a tad gimmicky. But this cigar is very tasty, easily among CAO cigars finest blends. Made in Honduras with a dark and chewy Brazilian wrapper leaf, The Sopranos Edition cigar boasts an intoxicating blend of Nicaraguan, Dominican and Columbian tobaccos with a Honduran-grown binder. This hearty combination works wonders and caters to those looking for a bold, but smooth smoke. Thick clouds of smoke float above as you enjoy a variety of pleasant flavors. Hints of coffee and toasted wood swarm the palate, and are complemented by a sweet, syrupy note on the finish. Complex, balanced and totally satisfying.